Pheew. 64 year old Magical Jazzy Ponytailed Paleo-Liberal Charles Johnson Calls 69 year old Mustachioed John Bolton a Paleo-Conservative Bigot Because Pamela Geller. Charles Foster Johnson is an idiot. Nobody agitates for war, except our enemies. Pam Pam Pam Pam Pam Robert Pam. Update 16 March: The story’s been told, so let’s tell it again, this time with a Magical Jazzy Ponytail. Charles Johnson Revisits Breivik’s Manifesto. Again. 1) Anders Breivik never once mentioned me or my site by name. He included articles from other places that had links to LGF in them. 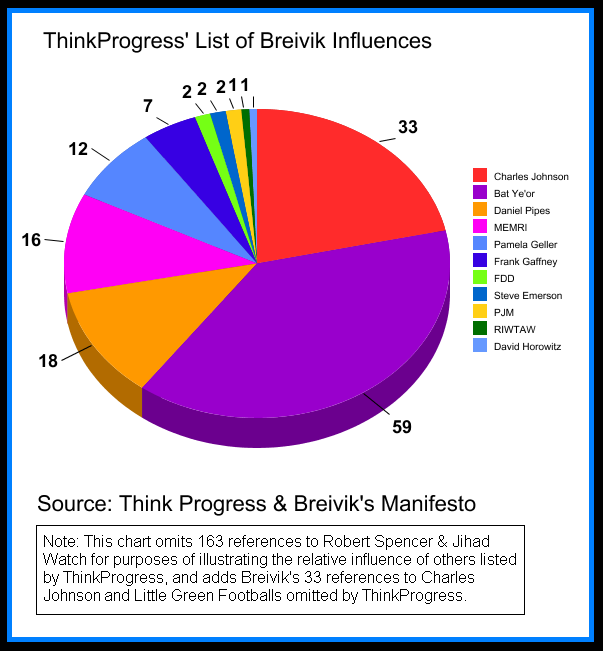 Remember when ThinkProgress posted a bar chart of Breivik’s influences based upon his online “Manifesto” and omitted Charles Johnson and Little Green Footballs? Remember when the BRC did a simple word search of Breivik’s “Manifesto” and found over 30 citations that were omitted by ThinkProgress? Remember when we posted an updated StinkProgress bar chart to include Breivik’s references to Charles Johnson and Little Green Footballs? Remember when Glenn Greenwald found it, verified it and reposted it? Heh. Remember when we turned the ThinkProgress bar chart into a pie chart? Even LGF communist in good standing Sergei Romanov pointed out the obvious. Remember when we showed how anyone could easily verify it with a simple word search? Charles Johnson is a lying coward. At least Glenn Greenwald is honest. Charles Johnson, Smartest Man on the Internet. Just started re-reading The Lord of the Rings for the first time in decades, and Peter Jackson made a good choice not including Tom Bombadil in the films. Man, that guy is insufferable. Dude is awesome. Awesome like a twelve-year-old with an Atari jones. Golf Pro Lawyer Charles Johnson Calls Out President Donald Trump For Using Golf Tee Markers Not Approved By Golf Pro Lawyer Charles Johnson. Awesome catch, Charles. You’re on the cutting edge of ignorance.